The controversial biopic tops this year's Metro Manila Film Festival list despite all the initial hitches it encountered. 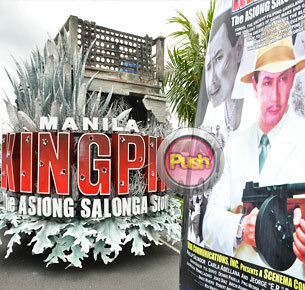 With a total haul of an unexpected 11 awards during the 37th Metro Manila Film Festival awards night, the action biopic Manila Kingpin: The Asiong Salonga Story was the undisputed big winner having bagged the Best Picture, Best Director, Best Supporting Actor and eight technical awards which included Best Cinematography and Best in Production Design. The show, which was hosted by Ai Ai Delas Alas, Richard Gomez and John Estrada, was held at the Resorts World Performing Arts theater last December 28. Top acting awards went to Dingdong Dantes for Segunda Mano although the actor was a no-show that night. Despite her movie Yesterday, Today and Tomorrow being disqualified by the MMFF board from four award categories recently due to unapproved changes in their script, Diamond star Maricel Soriano still won the Best Actress award but was also not present to receive it that night. John Regala won Best Supporting Actor for Manila Kingpin while self-proclaimed 'Festival Queen' Eugene Domingo won Best Supporting Actress. The top comedienne is currently included in three MMFF entries, Enteng Ng Ina Mo, Househusband and Shake, Rattle and Roll XIII. Catch the Metro Manila FIlm Festival Awards Night as it airs this Sunday night, January 1 on ABS-CBN. For more updates on the hottest celebrity and showbiz news, log on daily to Push.com.ph and follow Push_Mina on Twitter. Gender Sensitivity Award – My Househusband... Ikaw Na!